Steph bought her first motorcycle at 49. 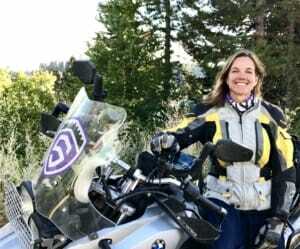 No stranger to jumping off literal and metaphorical cliffs, she figured why not speed things up by doing it on an adventure bike? Steph believes adventure riding is the ticket to transport humans expeditiously out of the black hole of a mid-life crisis. Steph is a DART trained Off Road Motorcycle Instructor and MSF Coach.